August 29, 2005 changed everything on the gulf coast. From landscape to language, and everything in between; you see and hear the effects in the everyday way people interact and live down to the smallest details. I guess its what they call “the new normal.” Obvious changes include new buildings, vacant lots, and remaining rubble. But even the way people think and talk has changed. “Before the storm” and “since the storm” has become the commonly accepted way to reference time. Katrina stands as a watershed in the world-view of the gulf coast. This past Sunday I distributed a pamphlet which included William Bradford’s 1723 Thanksgiving Day proclamation. 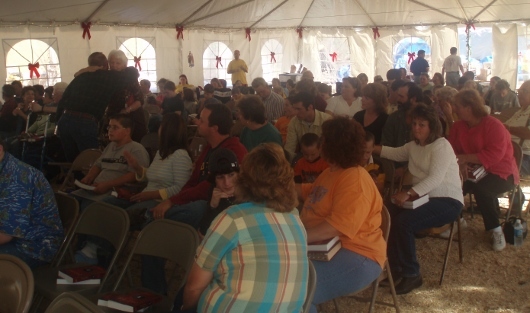 Before the service, I mentioned to one of our church members that I had a tract about the “First Thanksgiving.” They automatically assumed I meant Thanksgiving 2005 and began to discuss that day. For nine weeks we had been sorting through water logged remains and mountains of destruction. 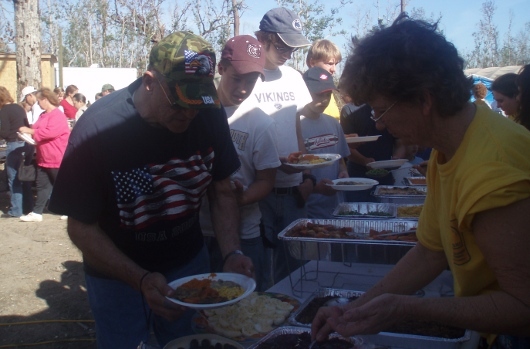 Living in tents and vehicles, and campers; military style MREs (meals ready to eat) provided the main source of food along with the Southern Baptist Disaster Relief and American Red Cross. Third world country living conditions slowed the progress and we probably had not yet realized how long of a road we had ahead of us. We were still trying to locate family members and friends to discover whether they had survived the storm. Betsy Serral first traveled to Lakeshore in the summer of 2006 with her church, Providence Presbyterian of Hilton Head, South Carolina. 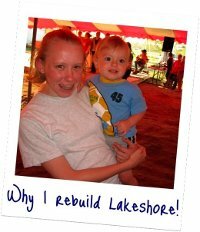 She quickly fell in love with Lakeshore and has become one of our most valued partners and closest friends. She has made her way to Lakeshore over a half dozen times since then. 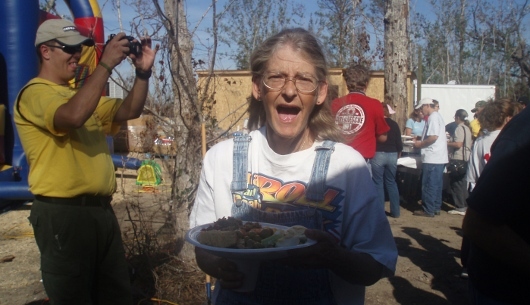 In her most recent trip, an extended stay in the summer of 2009, she noticed that our very old utility van, used to transport building materials to the work sites, had been pushed well beyond its time of usefulness. On her return home, she took the initiative and raised the money necessary to purchase a new vehicle for the rebuilding ministry here. 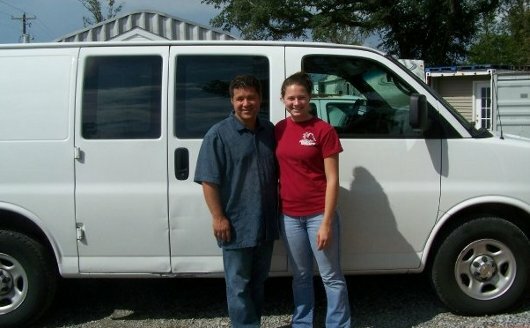 We now have a 2004 Chevrolet Express utility van. Thanks Bets! We love you. Our friends from Trinity Community Church of Trinity, FL made this great video of their mission trip to Lakeshore. 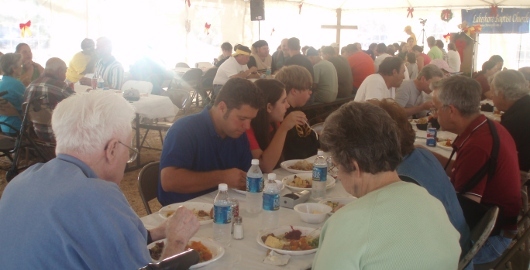 For those planning a trip, it gives a great glimpse into a week in the mercy ministry efforts here and what God has been doing in the lives of those who come. In just about 8 short weeks we will ring in the new year. Between now and then we have 8 mission trip teams schedule to be in Lakeshore. For those familiar with the relief, recovery, and rebuilding efforts here, you know that sometimes we have 8 teams in one week. This slow down during the holiday season allows us to project a bit into January where we will have hundreds of hands eager to continue the progress. If you promise to realize that all plans remain tentative, I’ll post a run down of our hopes as to particular projects on the church property. 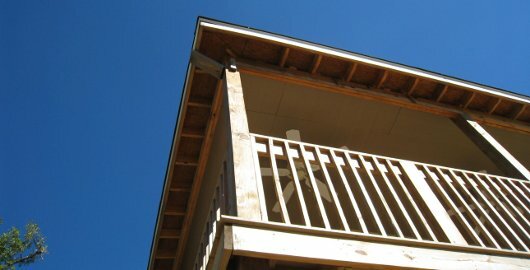 Stain wrap-around porch, railing, and exposed wood. The soffit, which hangs about 20′ above the ground will require some sort of scaffolding to install. We also need some folks not afraid of heights for this job. 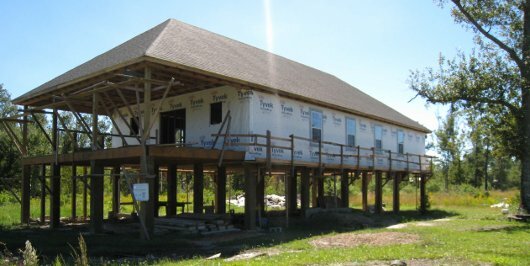 We have a slab under the 30′ X 50′ main house, but now we need to build concrete forms and pour a slab under the 8′ wrap around porch and sidewalks out to the stairs. Having this concrete work complete will open up the next project on the agenda – screening in the lower level. Actually, since the green plate for the screened in area will sit on the existing concrete, we may be able to tackle both these tasks simultaneously. I have been so pleased watching the Mercy House come together. I have great hopes for this facility as our church continues to grow in its mercy ministry to the glory of God. 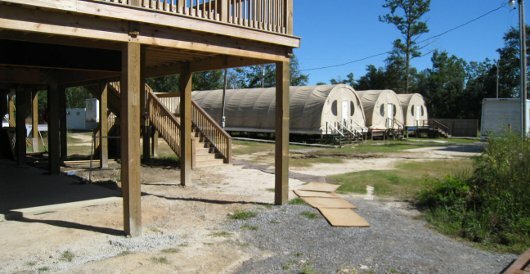 Behind the Mercy House we plan to erect a 30 X 40 metal quonset hut, similar (but smaller) to the one we currently use for worship and other things. The materials for this building were donated a while back but we never had a place in the master plan for it. We do now. This structure will serve as storage for the Mercy House ministry. In January we will need to prepare the site and pour the slab. The well for the Mercy House sits in the front yard. In order to present an esthetically pleasing front to the Lakeshore Road traffic, we have designed a small 10 X 10 pump house that will match the look and feel of the Mercy House. We plan to have crushed limestone parking for the mercy house off of third street, parking for the church property along second street, and parking in front of the bunk house. We will need this property graded for proper drainage and the limestone spread. Having this done will greatly enhance our property for everyone. 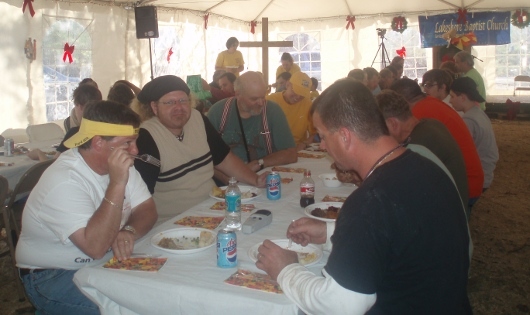 We do not plan to begin the Fellowship Hall until the completion of the Mercy House. Once the distribution center relocates to the new facility, site prep for the new fellowship hall can begin in that space. Please join us in prayer as we continue making plans for this building.